This brochure defines abuse and offers warning signs for recognizing abuse. It describes the particular characteristics of abuse in homeschooling settings and lays out ways to help abused homeschooled children. Designed with homeschooling parents and communities in mind, this brochure should prove helpful for anyone frequently in contact with homeschooled children. Download in full color or black and white. 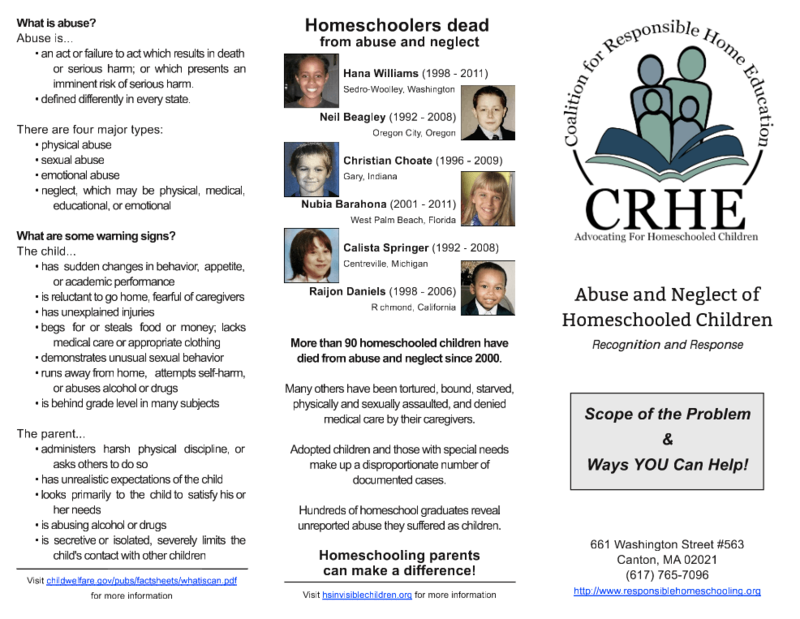 This presentation defines child abuse, lists warning signs, describes particular characteristics of abuse in homeschooling settings, and lays out ways to help abused homeschooled children. Designed with homeschooling parents and communities in mind, this presentation should prove helpful for anyone frequently in contact with homeschooled children. This presentation covers the ways abuse in homeschooling environments is different from abuse in other environments, and what that means for the children affected. This presentation should prove helpful for anyone interested in learning more about how to help abused homeschooled children.